I’ll be the first to admit that I used to be emotionally weak in my relationships – not in a silly, desperate way, but in the same way that many of us are. I wanted somebody to make me happy, I blamed others for my sadness, and I sought to fulfill my emotional needs through other people’s constant validation. I had lots of relationship problems, because if the other person’s behavior wasn’t satisfying my needs, I’d get upset and resent it. I’d often be unhappy, because I was looking for all my happiness outside of myself, expecting others to somehow fill my self-love deficit. I felt helpless and stuck in many cases, because if other people are supposed to fulfill my needs and make me happy, then what happens when they don’t? What could I do if they decided to hurt me instead? I hadn’t a clue. Fast-forward to today, and it’s clear that I’ve spent the better part of the past two decades turning things around and cultivating my emotional strength. And it has made a world of difference – my relationships are healthier and I’m happier. When Angel and I began our blog and our coaching practice several years ago, countless people started coming to us who were suffering from the same kinds of emotional weaknesses I used to have. So I began sharing the strategies that helped me heal and, not surprisingly, they worked for these people too. We’ve refined them gradually over the years into a very useful, simple process. Are you looking for a partner to make you happy? If you’re in an intimate relationship, do you look to this person to validate all your needs? When you’re alone, do you feel pressure to fill your alone time with constant distraction? Are you always on your phone/tablet/computer/etc. when you’re alone? Do you get upset if your partner doesn’t do things your way? Is your relationship your entire world? What about your relationships with friends or other family remembers? Can you tell where their needs end and yours begin? Do you get upset if your partner doesn’t include you in what they’re doing 24/7? Obviously, this list isn’t comprehensive, but I’m betting you can see yourself in a couple of those questions, at least to a certain degree. And that doesn’t mean you’re broken. Most people struggle with several of these issues, though many will likely deny it, because they worry it might make them look inferior to others. No one likes to look that way, or to think of themselves as weak. But possessing any of these issues doesn’t make you anything but human – it simply means you have something positive to work on. The kind of thinking that leads to emotional weakness typically starts in childhood. We rely on our parents for all our emotional needs – love, comfort, validation, etc. And thus, we don’t often fully develop the skills to independently support our emotional strength as children, because our parents, out of love, do their best to provide for all our needs. We are not emotionally independent, and so we do “needy” things that hurt our relationships. Our partners are struggling in the same way. At the end of the day, how confident you are is essential to the results you will see from your efforts (especially in your relationships). And on a deeper level, when you know you can count on yourself to do the things you say you want to do, it becomes easier to believe that you’ll be successful at bigger, riskier things. Remember that practice makes progress in all areas of your life. Happiness is something you decide on, on your own, in the present moment. Whether you like your home or not doesn’t depend on how the furniture is arranged – it’s how you arrange your mind. You have to decide to love it just the way it is. It’s a decision you make every morning when you wake up – you can spend the day in bed recounting the problems with the parts of your life that no longer exist, or get out of bed and be thankful for the parts that do exist. It’s up to you, and only you. All the validation you need is yours to give yourself. So the next time you feel pressured to impress someone, try taking a deep breath and remind yourself that you don’t owe anyone your justification. Revel in the reality that you get to choose. You have the authority to decide how to spend your time and energy. And here’s the real beauty of it: When you don’t owe anyone anything, you’re free to give and love from the heart. When you change how you show up to life, everything in your life changes. That’s the powerful part of the simple steps below. By becoming emotionally stronger, you not only have the power to change your world, but other people’s worlds as well. You have the power to change the entire world in some small way by showing up as the strongest version of yourself. The present and future are not set in stone, they are in your hands. At this point it should be clear that other people are an unreliable source of your own emotional needs – they will come and go, or they’ll be emotionally unavailable sometimes for their own personal, uncontrollable reasons. Sit by yourself for 20 minutes each day, without a phone, tablet, TV or other distraction. Look inside – meditate. Notice your thoughts as they come up. Get to know your mind. See how fascinating it is, as you jump from one thought to the next. This in itself is an infinite source of entertainment and learning. Create something – come up with ideas for building something from the ground up and then do it – a poem, a painting, a song, an action plan, a business, etc. You don’t need anyone to do those things, and they give you added insight into your own abilities and passions. Curiosity is a boundless source of happiness for most people. Exercise it. Explore. Travel. Educate yourself. Read good books. Deepen your knowledgebase on topics you enjoy. Talk yourself through your own problems. Find a solution. If you’re bored, fix it. If you are lonely or hurt, comfort yourself. If you’re jealous, don’t hope that someone will reassure you … reassure yourself. Take responsibility. If you find yourself blaming others, tell yourself that the other person is never the problem. Of course, you can choose to believe the other person is the problem, but then you are dependent on them for a solution. If you believe that they aren’t the problem, then you are able to look inside yourself for the solution. You create your own source of built-in happiness and validation, and then you walk around as a whole, happy human being, needing nothing more. Come from this place of wholeness, of emotional strength and independence, and then love others. Not because you need them to love you back, not because you’re desperate to be needed, but because loving them is a miraculous thing to do. Which point in this post resonated the most with you? Do you have any related personal stories to share? Please leave a comment below. We would love to hear from you. Also, if you haven’t done so already, be sure to sign-up for our free newsletter to receive new articles like this in your inbox. Sometimes it’s just so hard to be levelheaded in your relationships when life gets stressful. I’ve lost track of my self-esteem to a great extent in the process. I realize now that my strength within a relationship is really just my emotional strength as an individual. I truly appreciate these reminders, and I am regaining confidence again. I’m a fairly new reader of your teachings – I actually discovered your blog when a friend gave me your book as a gift for my birthday. I enjoyed it so much I subscribed to your blog emails. Honestly, your perspective is just what I need to read these days. Thank you so much for helping me stay strong during a difficult transition in my life. Wow… love this post! For me it’s all about taking responsibility, and I’m all for that. It’s the beginning and end of all our problems, one way or the other. Please keep up the great work you both are doing. You’re welcome, Rebecca. I’m glad you’ve found value in our book and blog. Just keep working on yourself, one day at a time. I love the idea that my emotional strength in my relationships starts on the inside, with just me. When I think of it this way, I realize how often I’ve looked outside myself for a solution only I had power over. This post perfectly reflects some of the recent changes in my mindset that your previous emails and blog posts have helped me with. You continue to make an incredible difference in my life each day. Just thought I’d let you know. That resonates deeply! Well said. Also, I fully agree with the ultimate message of looking within, being your best, and then bringing your best into your relationships. This post is really helpful to me.. There a lot here that makes sense and that I need to work on. Perfect timing. I do get upset when things don’t go my way , learning to let go. I continue to work on inner happiness . Yoga, meditation , breathing. ….self reflection . Some days easier than others. Thinking positive thoughts! We love Yoga and meditation too. Both are such healthy ways to unwind. Happy birthday, Floria! And thank you for the kindness. I thought at one time I was so very strong. I’ve pushed myself to doing things I was afraid to do – going back to school, running a business, running 2 half-marathons. Somewhere on the way I lost that. Facing a serious bump in the road of the life I had planned after a divorce, my self-esteem and self-worth has plummeted. I’m challenged by this posting, so much of it was written directly for me it seems. I didn’t think I had become so co-dependent, but yep, this is the reality I have to face. Is it possible to just flip a switch? Kathy, it’s about flipping the switch on what you will consciously focus on from this point forward. You will still slip-up — you’ll catch yourself focusing on the wrong people and circumstances sometimes, but the daily practice of catching yourself and refocusing on the the things is what will yield you incredible results over the course of a year or so. It’s gradual journey, and it’s worth it. Thank you for another powerful post!! This made me think a lot as I often find myself worrying about finding love. Although that isn’t also wrong but obsessing over and getting sad without something is useless. Because ultimately it’s all since I don’t want the options I already have, I want somebody perfect. That person will take time to come along. When the Universe sends you a message you have to be alert to see it and prepared to do the work. I had several “AHA!” moments. Thank you for a perfect start to a new day. I have a good friend who has been moody, short and distant and other times nice and outgoing. Because she has experienced and an extreme life change, I’ve overlooked the moodiness and snippy behavior. I didn’t realize the impact of her behavior until I noticed how much time I spend discussing how she makes me feel with other friends. Sometimes I spend my days sad and unmotivated after a conversation with her. Thinking I could talk to her about her behavior, she unapologetically accused me of not understanding what she’s going through. I tried explaining that what she’s going through doesn’t give her permission to rude. After countless emails and phone conversations attempting to get her to understand, the result is endless frustration and sleepless nights. 1. I am looking to her to solve this problem. When in fact I am the one responsible for solving it…..AHA! 2. I seek validation from her…….AHA! It sounds insane when I think about it. I approached her several times to address this issue to no avail. I was hoping she would one day proclaim, “you’re a good friend, I appreciate that you drop everything to help me and I don’t mean to be mean to you”. It’s never gonna happen! I have allowed this situation to make me feel inadequate. I often think maybe if I would’ve simply approached her in another way or called at a different time maybe she wouldn’t have gotten snippy. I’ve made so many excuses. These feelings have spilled over into other relationships. I’ve accused other friends of not valuing the friendship I have with them when in fact my problem is with her and I feel she doesn’t see the value in the friendship she and I have. Thanks again! I have a lot of work to do. Thank you Joanna B… Your reply to Mia has helped me see my faulty thinking with a few ‘friends’ … This is my journey and I need to learn what suits me… Not them… Have a blessed day! Mia… Thank you for sharing your ah’s… So true for me too! I look forward to your emails every morning! It sets the feeling of how I want my day to go and days turn into weeks which leads to a lifetime of positive thinking, and for that I thank you both Marc and Angel for sharing what you obviously “get”. So now I will challenge myself to sit quietly for 20 minutes by myself, just me and my thoughts! Wow- that may be more difficult than I can imagine. I will push out the negativity and welcome only the good things I have accomplished. I had a revelation the other day and I am not sure if I heard it hear, or somewhere else, but I find myself going back to it ALL the time lately, whenever I slip. The idea is that living in the past is depression and living in the future is anxiety. I want to be in neither. I want to be here, now. Blessing to you for your gift to us to share the secrets of the universe, which really aren’t secrets at all! “If you find yourself being needy, instead find a way to give. Both of these made me cry, from a reality check. I don’t need anyone’s approval, I’m a great friend if they don’t see it, I’m still me. Thanks Marc and Angel your words are on point during my journey. Lots to learn still. I started reading this last night and could not rest until I found it today. Speak of aha moments, light bulb coming on, revelation, it was all those and then some. When you change how you show up to life, your life changes. That statement was so powerful. It woke me up. Your article spoke to my very being, how I blame others and not take responsibility for myself. I immediately signed up for your newsletters. I will be patiently waiting. Thank you.. Your best article undoubtedly! This really struck a chord deep within. I keep on reading countless books to help me understand how to be happier. Yet the next moment I can’t seem to apply that to my life. Now I will remember the words ‘ how you show up to life’ always. It’s all about being present to yourself and honouring every moment of your life. When we do this, the things that seem so challenging change. Beautiful article. Thanks again. Becoming emotionally strong – 1st point striked the most..
We can’t truly love someone until we learn to live with and love ourselves. This was fantastic, thank you! Joanne B., try to start out with 5 minutes and then gradually increase your time. That works for me. I love this post and is very close to what I’m currently going through. I’m in a new relationship and I’m learning so much in terms of self-awareness and being secure in myself. This post will be one I review frequently which will remind me of my own strength and how I can overcome my weaknesses in my relationship. Continue to create these wonderful messages. I am growing each day with the help of you both. You two are true Angels on Earth. This article proves it. Thanks! I’m on the flip side of what this post is about. I feel like I’m so strong emotionally that I mostly don’t need anyone. This attitude ends up hurting people who genuinely care about me. Any advice on how to fix this problem ? I know of all of this to be true in my head and my heart. I’m in the most challenging relationship I’ve ever been in. Mostly because it challenges me to be very present and very self sufficient while giving freely of myself. I’ve struggled in the past with giving too much and felt depleted. I don’t feel the victim because I know it is my choice. I draw strength from my ability to give my love. The missing pieces at times are when I give more to him than I do to myself, when I lose sight of the simple fact that I need to put my needs first because no one else will. My problem is in assessing when to let go of a relationship. I love him. He has made it clear that he loves me but he wants to be free to love others as well through intense physical and emotional encounters. If I love him and do not look to him to satisfy that little girl inside me that wants love and approval does that mean I will be able to manage my jealousy? Will I leave behind the rock in my stomach when I know he is somewhere else loving another person? Does becoming strong mean that I can stay in this situation or does it mean I would express my self love by leaving it? Am I weak to feel so torn? If I loved myself more could I stay and hurt less? Confusion clouds my heart and I lose sight of what actions would result from my strength. Do I stay or do I go? I’ve had my guard up about getting into another relationship. I have blocked out anyone that I had a chance to like again. I think I might take that chance again knowing how to practice loving myself by looking within and not relying on the other person for my happiness. Once I know how to make myself happy independently, I can share that happiness with someone else..
Everyone has to make their own choices Lynn. But staying in this relationship will probably shut you off from a different relationship you may possibly find where someone else would love you back in a way that works better for you. Being strong is also about doing what is best for you. I became truly happy with my marriage and myself the day that I decided to stop trying to change my spouse into something or somebody he wasn’t. I now accept him for the great person he is and I’m finally really happy with who I am. Thanks for a wonderful post. Since I started following your blog, I have really learned a lot over the past months and I am still learning. This article is another classic one. Truly as a person, I have to really love myself and not blame people for my happiness. You have reminded me. And I will reread this to allow it sink in my system fully. Thanks to you and your wife for an awesome job. Thank you for sharing such a great thought. I almost cry when I read this post and I’m totally convinced that I am an emotionally weak person. I’m now in a distance-relationship and since we are separated, we have not share many of our lives together, that’s the reason why sometimes i feel sad and stressful without him beside and feel totally lonely every single night. I was silly blamed everything on him, for his 24/7 without me in it and after I read this post, I think I should stop all of those stupid thought and focus improving myself stronger. This will be a huge change for me. 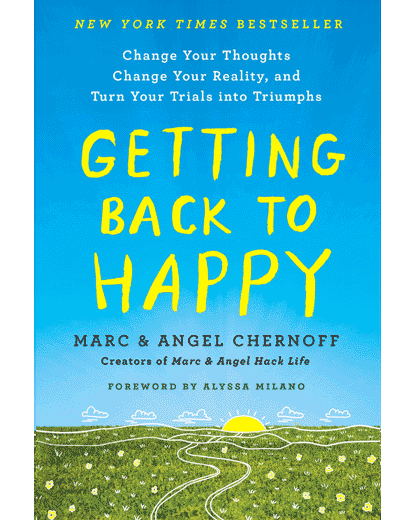 Thank you MARC CHERNOFF and your husband again ! When I tested my emotional strength based on my last relationship I failed that section miserably! Thanks to your articles and many like them I am working on ME before I start another relationship. This article hit very close to home for me. I’m just glad to know I’m not alone and have been and will continue taking your advice. Thanks so much.